We’ve just finished trawling through every single module on Learn for the purposes of auditing against the Minimum Module Online Presence (MMOP). The revised MMOP was approved by Learning and Teaching Committee last year and, compared with the previous version, introduces modest additional requirements such as the presence of a reading list on the University Reading List System. You can find the minimum presence requirements here. Puzzled by file upload in Learn12 / Moodle2? In the new version of Learn based on Moodle 2.2, you can now drag-and-drop files from your desktop directly onto the module page (ie avoiding the need to upload a file first then link to it). You can even select multiple files to drag-and-drop at the same time. This is now the quickest and most intuitive way to add or update resources on your module page. In order to do this, you need to use a compatible web browser – Google Chrome, Firefox or Safari NOT Internet Explorer. Loughborough staff: as IE is the supported Windows browser on campus, note that this advice applies if you are using a Mac in your office, or if you are working on your home PC. This is a Dutch software app which claims to do much the same as TurnItIn (TII), only cheaper. A trial was set up whereby 20 files which had already been passed through TII were put through a demo version of Ephorus. •	The Ephorus demo account that was being used only checks against the internet. The full TII account used checks against the internet, publications and past submissions. •	In no case did the two systems come up with the same percentage matching text, or the same list of primary sources. •	In 7 out of 20 cases, the matching text scores would lead to the same conclusion by the tutor even though the numbers weren’t the same. In the other 13 cases, the scores were radically different, with Ephorus scores typically much lower than TII. •	In the one case where text from foreign-language websites had been used, Ephorus was demonstrably better than TII (Ephorus scored 62% for the 100% plagiarised text, compared to 31% for TII). •	Whilst Ephorus seems to be better with foreign-language texts, TII has better coverage of English-language publications. This supports Ephorus’ comment that their European-language database is currently much better than their English-language database. The conclusion is that the use of Ephorus can be justified for checking foreign-language texts, and maybe as a second opinion on tricky TII cases. The reports generated by Ephorus are similar to those produced by TII, available online and as PDF documents. •	Ephorus accepts the same file formats as TII, and takes typically 5 minutes to process a document. •	The Ephorus display shows the matching text, but doesn’t show which bit goes with which source, making it difficult to check the context. It can show alternative sources for the same text, and allow you to skip a source (e.g. an earlier draft), but these facilities are hidden (so infrequent users would forget about them and require re-training). •	File storage is organised on a per-tutor basis, whereas per-class would be better. Not clear how well the user interface would cope with large volumes of coursework. However, these problems go away if the Moodle add-on is used. This adds controls to the standard single-file upload assignment activity so that all submissions are automatically checked and the score made available on the marking page. This is equivalent to the TII Assignment activity. 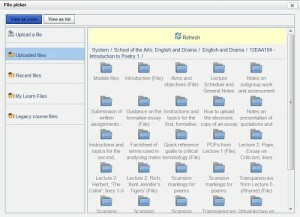 •	If you use the web interface rather than the Moodle (Learn) interface, the Ephorus administrator has to create all tutor accounts, and all of the individual assignment accounts – precisely the scalabilty nightmare that we use the TurnItIn Assignment activity on Learn to avoid. The Learn integration would get around this. •	Ephorus’ adverts are rather naïve in claiming to prevent plagiarism – we are trying to wean people off the idea of ‘plagiarism checking’ and towards ‘text-matching’ because matched text may have been correctly cited, whether or not it is enclosed in quotes. 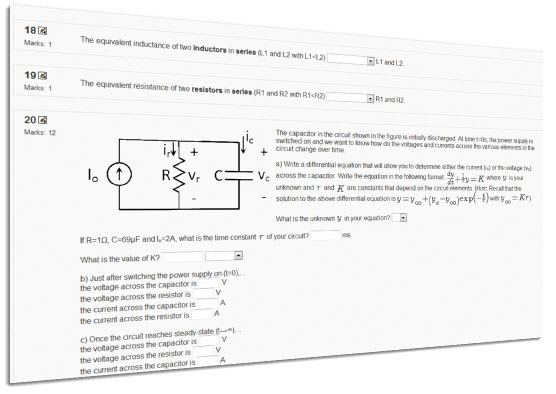 Felipe Iza uses Learn Quiz for formative assessment with Loughborough University first year Electronic, Electrical and Systems Engineering students. He and his colleagues introduced a series of formative assessments throughout the course of their module designed to motivate and provide feedback to students, and to keep the module tutors informed of progress. Using Learn, the University VLE as the delivery mechanism, the tutors were able to automate the process to accommodate a large cohort of students. Felipe discusses the reasons behind introducing the quizzes, the positives and negatives, and the response to the quizzes from both students and staff which would be interesting to all considering using an online quiz. 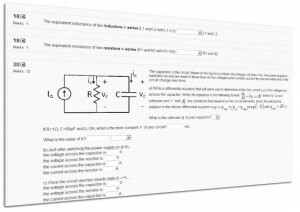 He has also used a template to generate multiple randomized questions within his subject area. In this video clip, Michel Cornette, a senior tutor on the University Wide Language Programme, talks about how he made use of the ‘Upload a File Assignment Activity’ in Learn / Moodle with his English class for French-speakers. As he explains, what he was looking for was a mechanism for managing the process of students producing and submitting self-recorded video presentations as coursework. Working with Professor Chris Szejnmann, Head of History, as part of his Teaching Innovation Award, we’ve developed a new e-learning authoring tool called Make History which enables Chris and his colleagues easily to create Flash-based historical timelines without the need for any technical skills. Each timeline is exported by the tool to a single *.zip file which can be uploaded to Learn. There are a number of free timeline authoring tools available on the Web but the Loughborough tool scores in terms of its suitability for HE. Once you’ve set the start and end dates for your timeline, you can add an introduction, colour-coded themes and events, and each event can have an image or short audio . video clip associated with it. Since my original post about Make History last August, the tool has had further development work and is now close to fulfilling its potential. 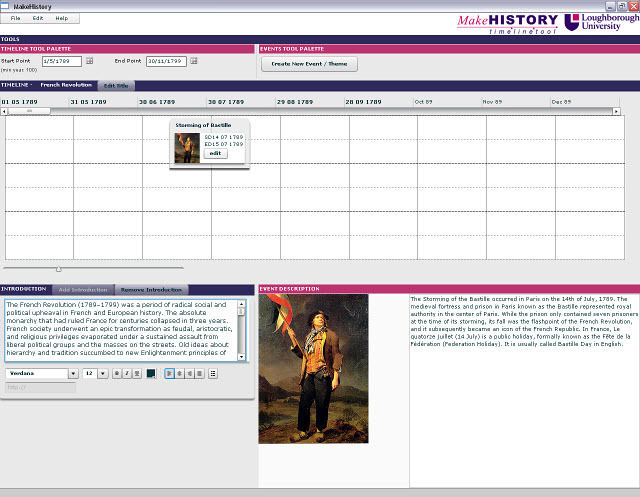 Applications of the tool are not limited to History; it could be used in any other discipline where it is useful to illustrate the development of theories etc through a scrolling timeline. If you’d like to try it out, get in touch via c.f.g.shields [at] lboro.ac.uk . You can also view the Make History support pages at https://blog.lboro.ac.uk/makehistory . This is a six-monthly event for TurnItIn (TII) Administrators and power users. The system continues to grow, with over ½ million submissions per month to the system in the last quarter of 2010. The UK branch of iParadigms (the U.S. company that built TurnItIn) now has responsibility for all of the world except the Americas, and will probably change its name from ‘iParadigms Europe’. Large documents don’t now cause the system to seize up. This has never been a problem for us, even with dissertations. We were promised better Quality Assurance for new releases – the revised user interface introduced in the autumn is only now fully functional. A Moodle 2.0-compatible plugin is promised for the middle of 2011. Work is under way on allowing multiple markers of an assignment. This would allow for double-marking of coursework, which explains why double blind anonymous marking is not currently under development. There were many requests for this feature. It was confirmed that TII submissions will still be visible to submitting institutions even after 5 years (we started using TII in 2005). The GradeMark online marking system received much emphasis at the meeting. It is only just starting to be used by Lboro tutors. It is now possible to import and export rubrics (marking criteria), so rubrics can be deployed over several assignments, and the same rubric can be used by several tutors. An ‘e-rater’ will be added to provide spelling and grammar checking for online submissions. However, TurnItIn is an American product, so it is not clear whether UK English spelling, punctuation, grammar and usage will be checked. A translation facility can be introduced to check for the possibility that a foreign-language source has been translated into English and used in a submission. Feedback files can be uploaded to GradeMark for retrieval by the student. These could be audio or video files e.g. a lecture-captured demo of a worked answer. An online marking Case Study was presented by Cath Ellis of Huddersfield University. She noted that the OU uses GradeMark and in the NSS it gets 100% satisfaction scores for feedback and marking. At Huddersfield there was a strong steer from HoDs to use online marking. The option for paper marking has always been kept open, but its use is now in the minority. Online marking is the default, and tutors have to opt IN to paper marking. Safer because the marked-up coursework was automatically archived on a server. Students liked the fact that they could submit from home, and didn’t have to make the trip to the campus just to hand in a piece of paper. They appreciated the private and unhurried view of the feedback that had been provided, and felt they got more detailed feedback than before. Admin staff set up duplicate copies of coursework to allow double-marking, but Anonymous marking is not used. You will know that Elluminate and Wimba were both taken over by BlackBoard earlier this year, and merged into a new concern called BlackBoard Collaborate. At an online webinar yesterday, the plans for the new company were outlined. A total of 236 people attended the session, which used Elluminate as its platform. It very quickly became clear that Elluminate was the senior partner in the merger. It had always been the larger company, and it was obvious that the new joint product (codenamed ‘Gemini’) would be based on Elluminate Live!, not Wimba Classroom. Work has already begun on Gemini, which seeks to merge the capabilities of Elluminate Live!, Wimba Classroom and Wimba Pronto into one product by the end of 2012. The new product will be a free upgrade to all existing customers, and would be both “browser-based” and “Java-based”. Support for Wimba Classroom will cease in 2013. All existing VLEs with integrations to either Elluminate or Wimba would continue to be supported. Video quality would be improved using Wimba’s technology, but retaining Elluminate’s low-bandwidth capability. By summer 2011 the Gemini phase 1 product will be available to Elluminate users, incorporating some (configurable) improvements to the user interface. By summer 2012 Gemini phase 2 will include Wimba features: a content repository allowing session resources like whiteboards to be stored, shared and re-used, and also archive movies of sessions will be available in .mp4 files. By the end of 2012 Gemini will support mobile devices in the iPad/Android class. From our point of view, changes will be minimal, since we already use Elluminate Live!. We will simply get an improved and expanded system. There was no word in pricing other than that Gemini will be a free upgrade for existing users. On the Summary screen (the first of 4 tabs the tutor sees when they click the link to the assignment) there is a pencil icon. Clicking this allows editing of the dates and times. You then need to click the tick icon (which replaces the pencil) to confirm the changes. The leftmost entry (11:49) is the start time and date. No submissions may be made before this. The middle entry (12:00) is the due date or deadline. No submissions will be allowed after this. The rightmost entry (09:05) is the marks posting date, after which marks will be made available to the students. The text field containing “Part 1” is used to distinguish between seperate submissions if the assignment requires more than one file to be submitted. You can normally safely ignore this.